This fall, the Notre Dame Institute for Global Investing (NDIGI) offered a new course — FIN 40685: Applied Private Equity Projects (APEP). Kevin Burke, managing director of NDIGI and assistant teaching professor in the department of finance, was inspired to create this course after visiting Harvard Business School last fall. He saw that pairing lectures with projects bridged the gap between theory and practice, which resulted in accelerated learning and increased student engagement amongst the Harvard MBA students. Burke returned to Notre Dame motivated to design and develop an undergraduate course that combines lectures that introduce core concepts with investment projects that emphasize practical application. Creating this classroom experience where students are able to practice private equity in an almost real-world setting fits naturally into NDIGI’s tradition of creating experiential learning opportunities for Notre Dame students. Student interest in Applied Private Equity Projects was high from the moment of its announcement last spring, drawing nearly 100 applicants for only 25 available seats. After the 25 students were selected, the semester kicked off with a series of lectures that covered the principles and fundamentals of private equity. In tandem, the students were introduced to their host private equity firm and to the case study that they would analyze throughout the semester. 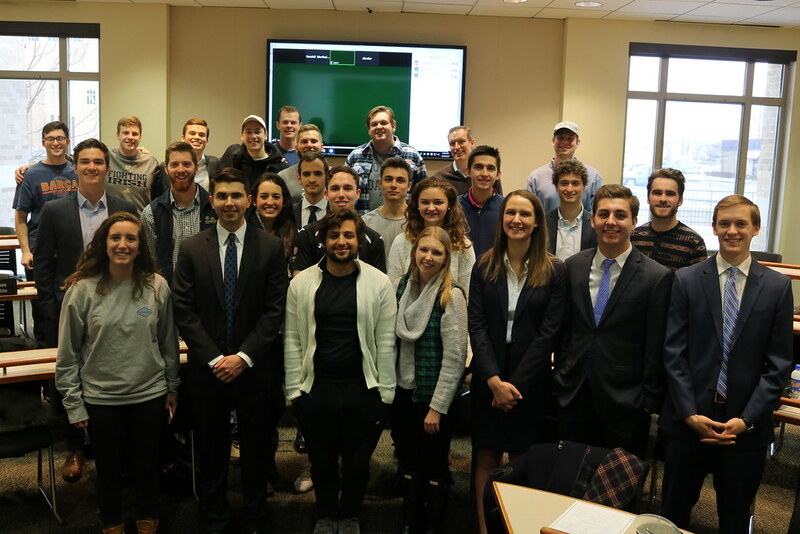 As the semester progressed, the course welcomed guest lecturers from private equity firms who spoke on a variety of topics including fundraising, deal sourcing, investing fundamentals, portfolio company operations and exit strategies. Senior Mike Singleton sees the lecturers as a testament to the strength of the Institute’s industry connections and as one of the most beneficial aspects of the course. “The speakers in APEP have been truly outstanding, and their willingness to speak in our classroom is largely due to the Institute’s efforts,” Singleton said. Senior Erin Callaghan also cites the guest speakers as an integral part of shaping her knowledge about the industry landscape. For some students, APEP allowed them to explore a career path that they had always imagined pursuing. For others, the course widened their perceptions of the opportunities available to them upon graduation. Senior Greg Trinkl, a member of the course, has had a longstanding interest in the private equity space and said the opportunity to work directly with a private equity firm on a challenging investment assignment has expanded his understanding of the nuances of the private equity investment process. Senior Kendall Marthaler said that by learning from the various guest lecturers, she has the opportunity to compare and contrast various aspects of the private equity world and to gain a better understanding of working in private equity. Through this course and other programs, NDIGI aims to provide opportunities for students to experience the investment world while they are still undergraduates. Marthaler said the chance to enroll in the Applied Private Equity Projects course has helped her discern a future career and navigate private equity opportunities. Senior Patrick Kenney commented on how the class prepared him for the recruiting process. Singleton said that Burke has been a helpful resource as he looks forward to landing and choosing a position after graduation. “[He] is always willing to speak with students, and he especially loves to help with recruiting and job placement,” Singleton said. APEP recognizes the importance of personal growth in the professional world, and strives to help students uncover the right career fit for their individual preferences and skillsets.